Continuing the Holiday cooking guide, I present Turkey Stock. Useful for making incredible Turkey Gravy and Turkey Dressing (or Stuffing, if you prefer it by another name). By the way, the recipe below works equally well with chicken parts to make chicken stock. 1. 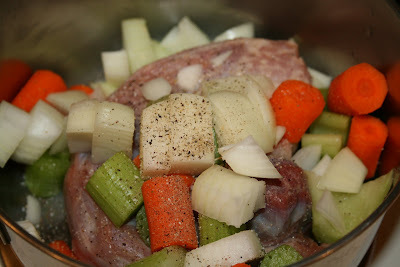 Place neck, heart, and gizzard in a 2-quart saucepan. Do not use the liver because it will make your stock cloudy and gritty. 2. Add carrot, onion, and celery to the pot. Cover it all with the water. 3. Bring pot a boil, then reduce to a simmer. Let simmer about 1 hour. 4. Remove neck, heart, and gizzard. Reserve for dressing recipe. 5. Strain liquid into a large measuring cup. Discard vegetables.